ANDREW KOHN Pty Ltd wins awards! 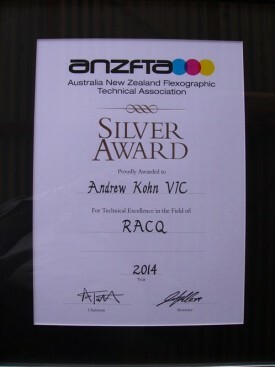 At the 2014 ANZFTA (Australia and New Zealand Flexographic Technical Association) conference and awards, Andrew Kohn Pty Ltd performed remarkably well by receiving 5 of the awards for print excellence! Out of 47 entries judged from submissions by 17 companies across both the Mid Web and Wide Web categories , Andrew Kohn were delighted to receive technical awards of excellence for our submissions and ended the night with 3 Silvers and 2 Highly Commended. A fantastic result and a reflection on the whole team’s professionalism and attention to detail! While external awards for great work are always appreciated, nothing compares to awards granted by our peers from within our industry. The awards panel also included judges from abroad ensuring that the awards were assessed against international best practise. A great result against stiff opposition – congratulations to the entire team!